Den with Murphy wall bed that folds into wall — closed position. 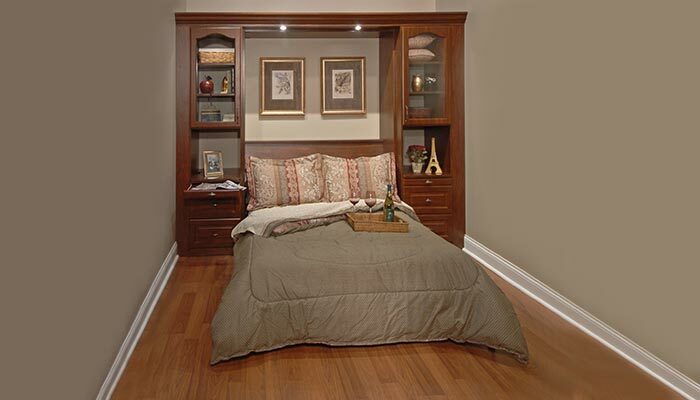 This Bed That Folds Into Wall Makes for a Comfortable Guest Room That Friends and Family Are Sure to Enjoy. Den/guest room with wall bed unit in the open position. Notice the high headboard behind the bed. This is a full bedstead with a quality mattress ready to welcome your friends and family in comfort and luxury for as long as they stay with you. Convenient LED lights are included for reading in bed. 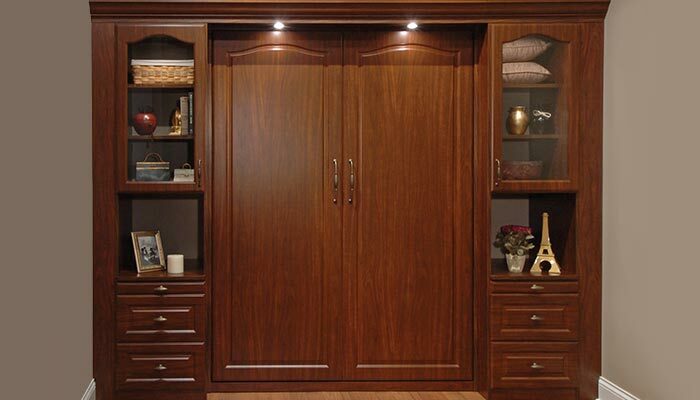 The wall bed unit cabinet features storage compartments with glass panel doors for an elegant feel. A pull-out table was included under each shelving section for the convenience of overnight guests. The drawers are deep enough to hold sheets and a light blanket — or even a couple of pillows. The entire unit is trimmed with crown moulding as a finishing touch, giving the built in piece a definite furniture feel. Pull-out table next to foldaway bed adds convenience without taking up any additional space.